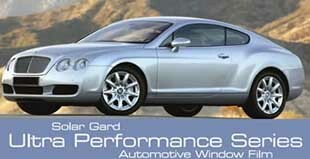 For years, the window tinting industry operated in much the same way. The market was dominated by a handful of manufacturers who cranked out product to meet growing demand, and many companies simply reboxed those films to sell as their own. There were known problems with this window film product: poor shrinkability, discoloration, cracking, peeling, bubbling, and delaminating. There were improvements to be made, for sure. To address these failings, we brought together the industry’s best and most experienced engineers for a singular purpose: to develop the most advanced window film the world has ever seen. Our manufacturing facility in North Carolina houses the newest and most advanced machine in the United States, and is now producing visibly superior window films. Maxpro was founded by industry veterans who had seen the strengths and weaknesses of the window film market up close. With their knowledge of the technology and the logistics of the business, they decided to bring to the market a new source of window tinting product, and so Maxpro Window Films was founded. All of our window films are 100% American made in North Carolina, and they’re backed by a limited lifetime guarantee against fading, peeling, cracking, adhesive failure, demetallization, and delamination. Automotive, residential, and commercial tinters alike can rely on the quality of Maxpro films to provide their customers with the confidence that they’re getting the best possible window films for their windows. Supported with the finest industry warranty, you can be assured that MaXPro films will provide you comfort and appearance as long as you own your vehicle. DarkMatter, Geoshield's premium automotive window film, uses nano-ceramic technology to provide uncompromising looks and outstanding performance. 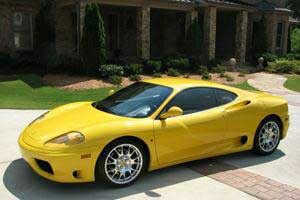 When looks and performance matter choose DarkMatter films. DarkMatter Ceramic Films provide outstanding solar heat rejection by using nano-ceramic particles to selectively filter out infrared heat at the glass, keeping you and your car cooler under the sun. Approximately 50% of the sun's spectrum is made up of infrared heat. DarkMatter Ceramic works to block out up to 86% of that heat from ever entering your car. DarkMatter Films use the latest in nano-ceramic technology to create a new hybrid film that provides both the benefit of being cell phone friendly, while outperforming conventional dyed or dyed metallized films. These films are made to block heat and media friendly by combining a color stable deep dyed polyester film with similar ceramic materials used by NASA on the space shuttle. This unique hybrid combination allows these films to have excellent infrared (IR) rejection properties, and filter over 99% of the sun's harmful UV rays, which will help protect your vehicles interior and passengers. And because Ultra Performance blocks over 99% of damaging and harmful ultraviolet light, you’re helping to protect your car’s beautiful interior from fading and yourself and passengers from premature skin aging. Ensure yourself a clear, ultra performing film that will last a lifetime – guaranteed! Performance results were generated with LBNL Window 5.2 using 1/8” (3mm) clear glass and have been measured, calculated and reported in accordance with ASTM, ASHRAE and AIMCAL standards. Saint-Gobain Solar Gard LLC is a participating member of AIMCAL and the IWFA. Performance results are subject to variations within industry standards and should be used for comparative purposes only. The patented Quantum films are fully metallized for maximum heat control and color stability.. Unlike conventional films which comprise dyed layers, Quantum films are warranted to never change color for the life of your home in residential applications. Quantum films offer high heat and glare rejection and are available in safety film thicknesses for the added protection against accidental breakage or forced entry. Quantum films also offer low reflectivity so you won't have to live with a mirror look day or night. Performance results were generated from testing 1/8” (3mm) thick clear glass and have been measured, calculated and reported in accordance with ASTM, ASHRAE and AIMCAL standards. Performance results are subject to variations within industry standards. Specific performance results are available upon request. 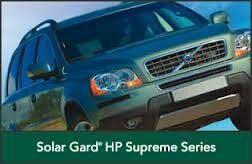 HP Supreme offers a stylish appearance and a new dimension in solar protection for enhanced driving comfort. The HP Supreme driving experience is a result of the film’s ability to block up to 58% of total solar energy and more than 99% of ultraviolet light. 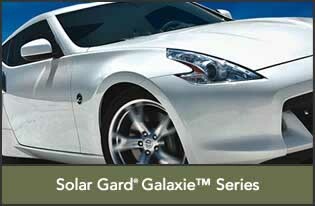 This ensures optimum heat control and solar protection like no other. HP Supreme offers an extensive range of shades including the darkest window film on the market with only 4% visual light transmittance. In addition, you will be glad to know that HP Supreme features industry leading film clarity for unaltered visibility and safe driving. Out of this world looks and performance with great heat control and signal friendly design When you want to make a statement, Solar Gard Galaxie delivers with its head turning finish and bold black look. The product life of these films will last you as long as you own your car or truck! 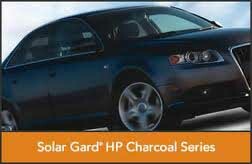 HP Charcoal features warm, sleek tones and features a metal dyed construction. It comes in seven shades to suit the look of your car. 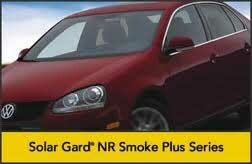 The Solar Gard Smoke Plus series are economy automotive window films that include both non- reflective (NR) and high-performance (HP) lines. These films offer you a classic look at a fantastic price. The HP Smoke Plus product is metallized for superior heat rejection while the NR Smoke doesn't interfere with GPS, Satellite Radio, and cellular phone transmissions. 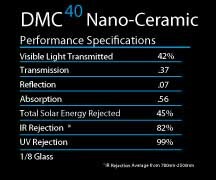 The NR film comes with a five year warranty for peace of mind and HP comes with a limited lifetime warranty and its metallized construction . Both offer UV protection to keep your interior from fading. and limited lifetime warranty for HP Smoke Plus. 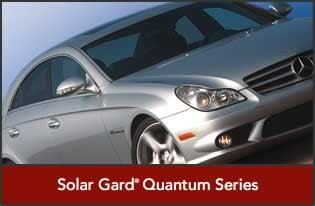 Solar Gard Clearshield is the latest, most advanced development in automotive paint finish protection. This nearly undetectable, protective urethane film is designed to resist impact from the everyday damaging road hazards such as gravel, debris, stones, road salt and even insects. 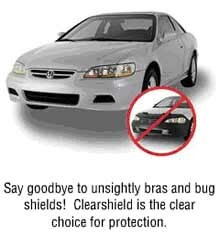 Clearshield is ComputerCut according to your vehicle's make and model so it fits like a glove on the most chip-prone surfaces, such as the hood, mirrors and bumpers, requiring no drilled holes or special fasteners like other protection products. 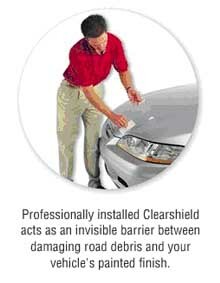 So, while you won't even notice Clearshield is there, it will be constantly hard at work helping to protect your vehicle from costly chips, nicks and scratches. Best of all, Clearshield is backed by a strong, 5-year warranty and requires no special maintenance - simply clean, wash and wax your vehicle the same way you always have.